At a nursery in Njoro, Kenya, ARS plant pathologists Matt Rouse and Yue Jin score wheat plants for their responses to infection with Ug99 rust. The scientists spend hours every day walking the experimental plots and rating thousands of wheat lines. Except for wheat breeders, producers, and scientists, few people have probably ever heard of einkorn wheat (Triticum monococcum), an ancient variety still cultivated in some parts of the Mediterranean. Emmer wheat (T. turgidum), found at some archeological sites and still growing wild in parts of the Near East, may be equally obscure. But these little-known grains and others like them could hold keys to saving one of the world’s most important cereal crops from an unrelenting fungus. Wheat is under attack by a fungal pathogen that has become an international priority for scientists. Ug99 is a strain of the stem rust fungus (Puccinia graminis) that threatens up to 90 percent of the world’s wheat and much of its barley. Even worse, the fungus is constantly evolving. Genes that seem to offer immunity one growing season become susceptible to newly developed “races” the next growing season. Since Ug99 was first reported in Uganda in 1999, at least six related races of the pathogen have been discovered. It has yet to reach the United States, but it is spreading throughout eastern and southern Africa, Iran, and Yemen. 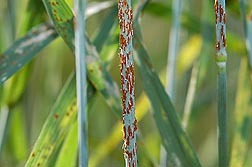 Close-up of stem rust on wheat. A strain called “Ug99” is now in parts of Africa and the Middle East. Researchers worldwide are working to identify genes capable of resisting Ug99 for eventual use in wheat and barley. As part of that effort, Agricultural Research Service scientists Matt Rouse and Yue Jin are searching for resistance genes among some of wheat’s lesser-known relatives. 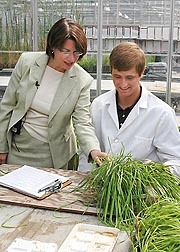 Both scientists are at the ARS Cereal Disease Research Laboratory in St. Paul, Minnesota. Along with einkorn and emmer wheat, candidates for study include goatgrass (Aegilops tauschii), triticale (x Triticosecale), and other wild relatives of wheat. Goatgrass is a wild relative of domesticated wheat, and breeders have tapped genes from it to boost the immunity of commercial wheat to a number of pests and pathogens. Triticale, found in some breakfast cereals and other foods, is a hybrid of rye and wheat. It holds promise because rye is nearly immune to Ug99. Also, triticale is considered a potential bridge for transferring genes from rye into wheat. Scientists often study a crop’s wild ancestors for genes that will confer resistance to emerging pests and pathogens. But what may be noteworthy is the diversity of grasses being evaluated by ARS scientists and others as part of the international effort to combat this fungal menace. Rouse and Jin say the extensive search is necessary because Ug99 evolves so quickly that breeders will probably need several resistance genes for “stacking” into commercial cultivars. That way, when the pathogen attacks, it will have more than one genetic hurdle to overcome. Several genes recently discovered by ARS researchers and their colleagues are being deployed by international breeding teams and are offering some Ug99 protection. At the Cereal Disease Laboratory in St. Paul, Minnesota, plant pathologist Matt Rouse (right) displays varying levels of stem rust infection to U.S. Senator Amy Klobuchar. In one study, Rouse and his colleagues focused on locating a gene in einkorn wheat that confers near immunity to Ug99. The gene, known as Sr35, was previously discovered in einkorn, but its exact location in the plant’s vast genome remained a mystery. The wheat genome is huge, containing nearly two times more genetic information than the human genome. To find Sr35’s position, the researchers sequenced areas of the plant’s genome where they suspected it was located. In one set of mutant plants, they knocked out the cloned sequences and found that doing so made those plants susceptible to Ug99. In another set, they inserted the same sequences into previously susceptible plants and found that it made them resistant. The report, published in Science in June 2013, was the result of several years of painstaking effort, and it marked the first time that any scientific group had managed to isolate and clone a Ug99 resistance gene. The achievement should make it easier to insert the gene into a commercial wheat variety, the researchers say. Rouse says Sr35 will work best if it is stacked with other genes, such as one found in goatgrass, known as Sr33, which was identified and mapped by another research team. Sr33 offers less immunity to Ug99, but broader resistance to other races of stem rust, so the two genes should complement each other, Rouse says. 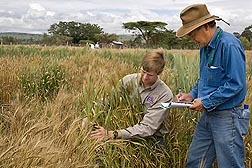 In other studies, Jin and his partners at the University of Minnesota probed the genetic potential of emmer wheat, triticale, and other wheat relatives using similar screening methods. They grew seedlings in an authorized, contained greenhouse in St. Paul, Minnesota, exposed them to Ug99, monitored infection levels, and used molecular techniques to identify genes unique to plants with resistance. Resistant plants were then sent to Africa for field screening. Such time-consuming steps are necessary to ensure that resistance is passed from one generation to the next. “Until you put the gene in the plant and put the plant in the field, you don’t really know how long the trait will last. It depends on the pathogen,” Jin says. Findings from the studies are shedding light on the mechanisms Ug99 uses to infect wheat and on different genetic tools available in some of the grasses to resist it. The researchers raised 567 triticale accessions (lines and cultivars) from 21 countries that were kept at the ARS Small Grains Collection in Aberdeen, Idaho. They exposed them to Ug99 and six other stem rust isolates. They crossed resistant and susceptible plants and analyzed genes of resistant progeny. Results, published in Plant Disease in April 2013, showed that resistance in triticale was usually conferred by single genes. They found similar results, published in Crop Science in September 2012, in screening 359 emmer wheat accessions. In goatgrass, they determined that resistance was race-specific and that only 12 of 456 accessions screened were resistant to both Ug99 and other races of stem rust. The goatgrass results were published in Crop Science in September 2011. The researchers say their goal is to leave no stone unturned in their search for Ug99 resistance genes. “We want to access as diverse a pool of genes as possible, so we do everything we can to help breeders deal with this,” Jin says.—By Dennis O'Brien, Agricultural Research Service Information Staff. This research is part of Plant Diseases (#303), an ARS national program described at www.nps.ars.usda.gov. Matthew Rouse and Yue Jin are with the USDA-ARS Cereal Disease Laboratory, 1551 Lindig St., University of Minnesota, St. Paul, MN 55108; (612) 625-5291 [Jin], (612) 625-7781 [Rouse]. "Looking to Wheat’s Wild Ancestors To Solve a Modern Problem" was published in the April 2014 issue of Agricultural Research magazine.